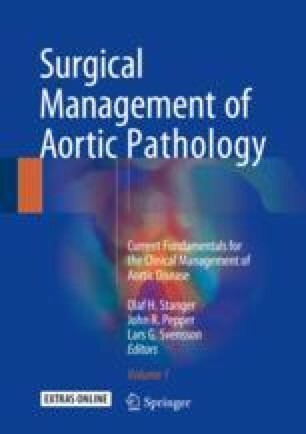 Acute ascending aortic dissection is a surgical emergency, and the primary goal of surgery is to save the patient’s life by preventing aortic rupture, correcting aortic valve regurgitation, and correcting malperfusion by restoring flow to the dominant true lumen in the downstream aorta. The conventional treatment for acute dissection has been complete resection of the intimal tear and replacement of the ascending aorta, often combined with a hemiarch replacement. As the results have improved, there has been a push toward achieving the goal of distal aortic remodeling for patients presenting with extensive dissection. This involves a more aggressive initial procedure with total arch repair, possibly with adjunct therapy of the descending aorta obliterating the false lumen by “frozen elephant trunk” approaches, with various combinations of retrograde or antegrade delivery of stent grafts in the descending thoracic aorta in an attempt to decrease the rate of late reoperation on the distal aorta. As the surgery for acute type A aortic dissection still carries a high perioperative mortality of 4–34%, the increased perioperative risk associated with more extensive distal aortic repair must be weighed against the risk of future reintervention and associated mortality.